A completely unique, comprehensive and intuitive system to uncomplicate and manage your event staff, job management, campaign reporting and so much more. The dashboard gives you a snapshot of everything you need to know as soon as you log in and manage your live campaigns seamlessly. Customise your view to make this the perfect control centre for you. 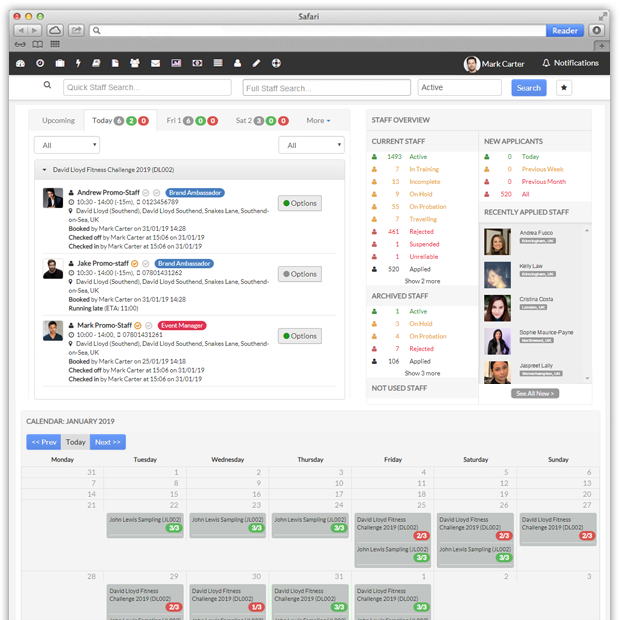 View a summary of “today”, staff statuses, booking statuses, a live newsfeed of applying staff, a calendar view of your upcoming timeline of events and so much more. 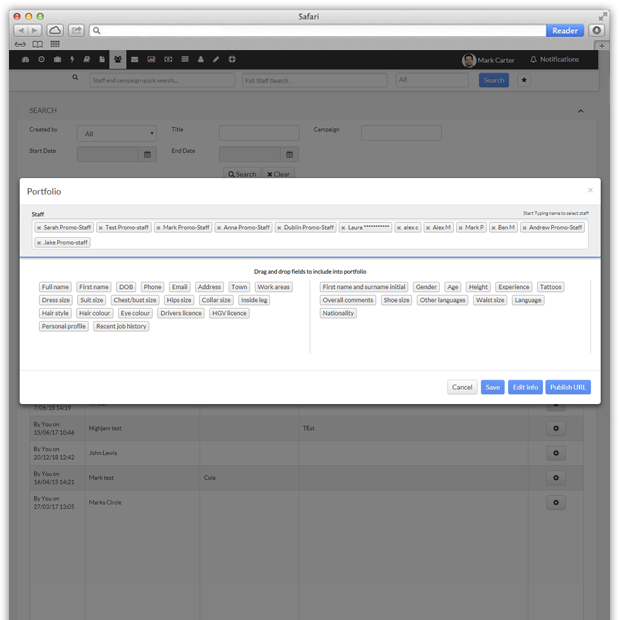 Scheduling and managing events is easy and intuitive, with everything in one place. 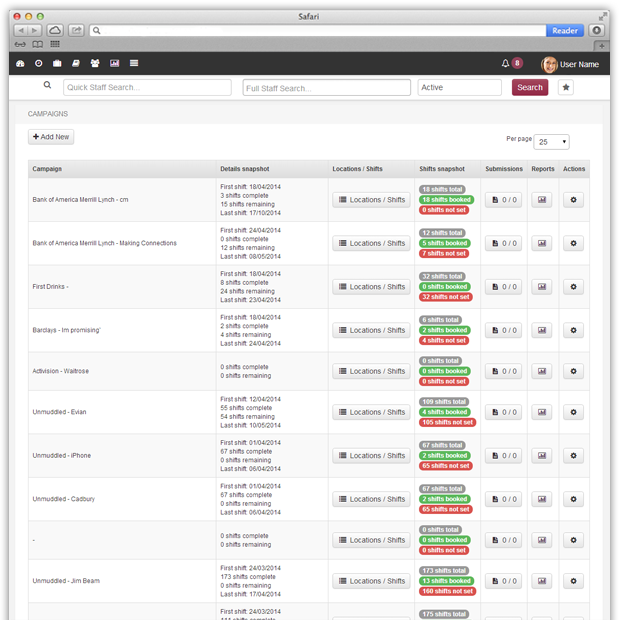 Organise your events by job, client and team and see your bookings, financials and what's left to do on the dashboard. Populating the campaign with the dates, recognised locations and staff required per location is made so easy by simply importing a CSV file or intuitive data input. We recognise that every campaign is different so you can upload each event in the easiest way - whether it be 1 staff per day in 200 locations or 200 staff at a single location per day - it's a piece of cake to manage. Keeping your staff database fresh and current can be arduous. But we give you the tools that allow you to manage and prompt unused staff so that you are only contacting people you who want to be the face of your campaigns. 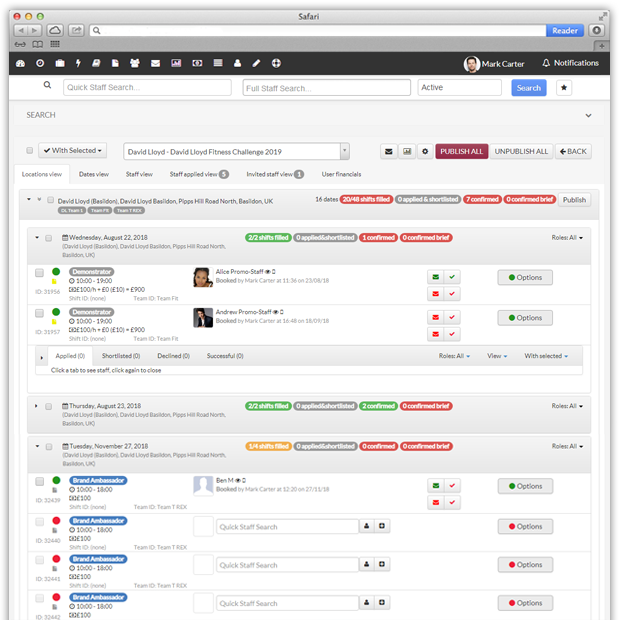 Your dashboard will automatically tell you when staff are not being used and then periodically contact those users to check their availability or if they wish to remain active on your books. An easy way to keep your database efficient without you doing the hard work. Invite staff to register directly into your database and they will be guided through a user friendly but entirely comprehensive step by step registration document collecting all the information you could need. Review and approve applicants, taking them through a digital interview template and creating a perfectly accurate profile. All you need do is accept or decline....with some niche advantages along the way! From our thorough registration and approval process, your staff are already categorised by personal attributes, experiences, working areas and much more – so finding the right staff couldn’t be easier. 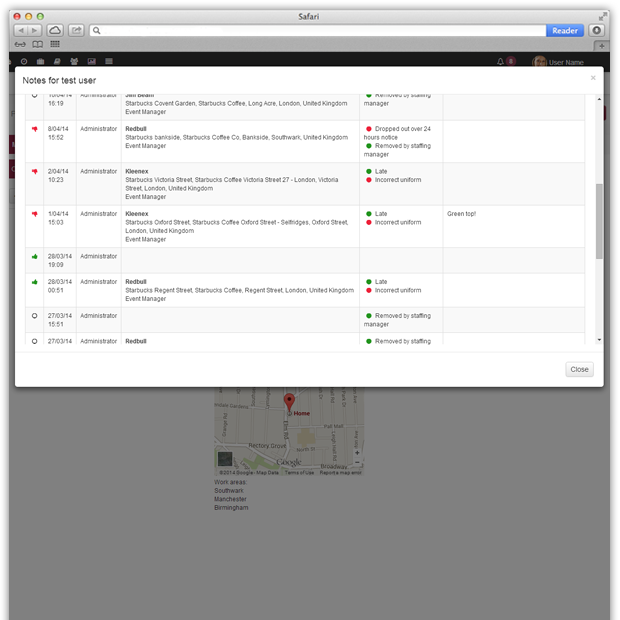 Search within a particular radius using geocoding built into the system. Your favourite staff will be weighted so that they appear at the top of your search and see the results in distance order if you are in a hurry. Save your most frequent searches to save you having to start from scratch! Build and reduce your search criteria using a system of coding or tick boxes and make these as specific or expansive as you need. 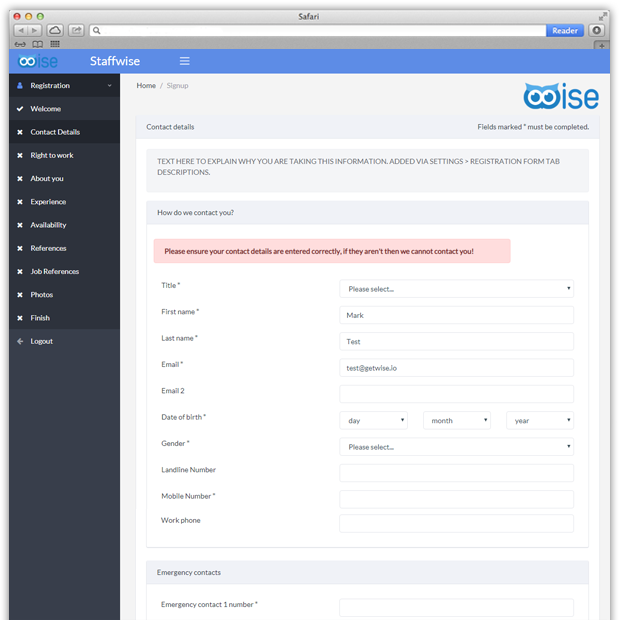 Fed up of creating staff profiles manually? With our system you can easily add staff to a shortlist, then tick what sections of the profile you wish to show, then even manually edit or add text to specific staff within that portfolio. Once done publish as a fully branded PDF or online URL to send to your client for review and approval. 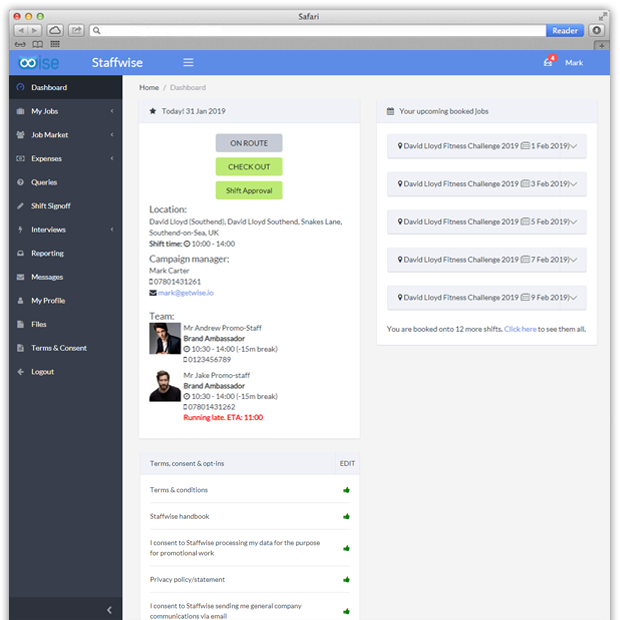 Fully integrated SMS, email and Push notification messaging built in, allowing you to contact your staff in bulk, individually or automatically at any stage in the search or booking process. Pre-determine frequently used templates, with the ability to attach any documents, or free-type personalised messages to an unlimited number of staff. Whether you are inviting staff to apply to a job, confirming a booking or advising a payment has been completed – it couldn't be easier. All messages are logged within the system for internal accountability so you can track all correspondence. There are many ways to get staff booked onto your shifts. 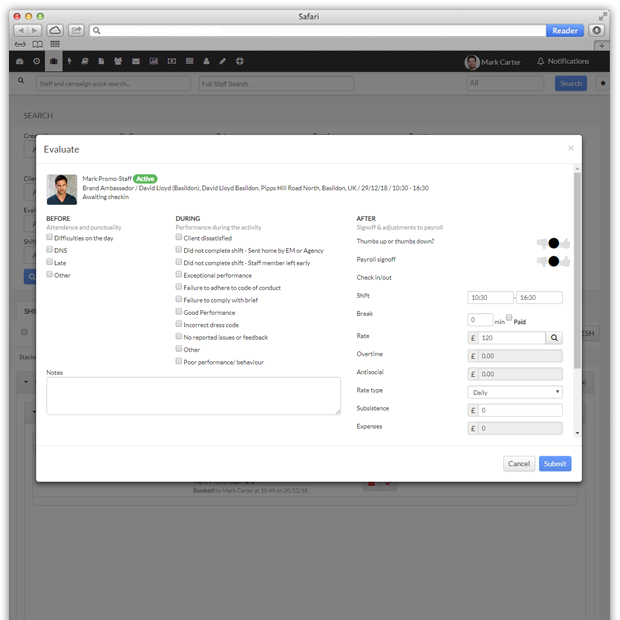 You can send out job invites or publish the shifts in the Job Market. Then allow people to apply and see real time notifications appear on your desktop warning you of those staff that have applied. 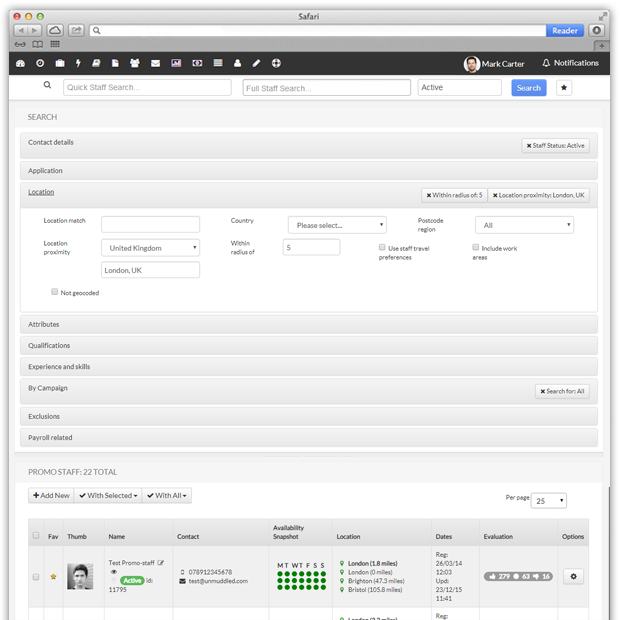 Then view the details of the staff and follow through with your own internal checking/booking process. Then when you are ready to commit them to that shift the system will automatically send them a booking confirmation email with all details and required attachments confirming they are booked. It really is all very easy. Ensure your database holds only the calibre of staff that you are confident to put in front of your clients as the face of their brand. Regularly filter out any staff who you no longer wish to work for you, saving your time resourcing. We offer a fully integrated staff rating system logging every day worked for you, pertinent information on their performance and recording any feedback. All in all allowing you to ensure the best staffing performance. Your staff can, at any time, ensure all their details are up to date and correct by logging into their staffarea. Provided with a unique login and password, this gains access to an entirely interactive platform for staff to apply for jobs local to them, pick up messages, view bookings and manage their accounts and much much more! This is compatible for mobile devices allowing staff to access easily from anywhere. Staffwise offer an exclusive staff app, available via the app store or privately. This provides the same information as their portal but much more on top. 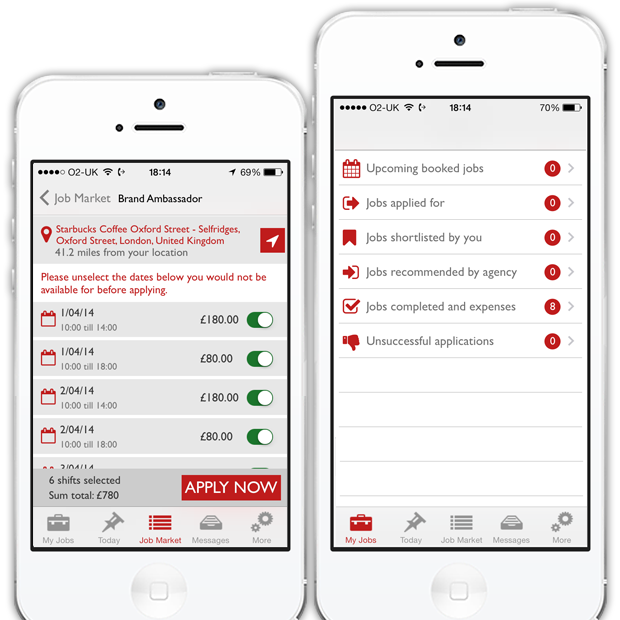 Staff can apply for jobs, view all booked campaigns and access live information about current bookings – including GPS directions to their meeting point, proof of arrival. and much more. This all links in directly to your system and their staff portal. Push notificatons are an intregral part of the app both manually via the contact module, or automatically sent to them for confirming their booked jobs, advising they have been invited to apply for shifts, or for just about anything you want them to receive. Contact us to learn more about this incredible tool! A flexible payroll system that can link into your system of choice. Ensure a direct correlation between hours worked and people to be paid, taking into account any extra expenses, bonuses or fines. A simple post job evaluation sends this information directly to your payroll. An easy export function feeds into your existing accounts setup giving you full control and no room for error when it comes to your staff accounting. We understand the level of reporting you will require outside of client data. From internal staff performance and other management information to field staff attendance to overall compliance. Tell us what’s important to you and we will make it happen. 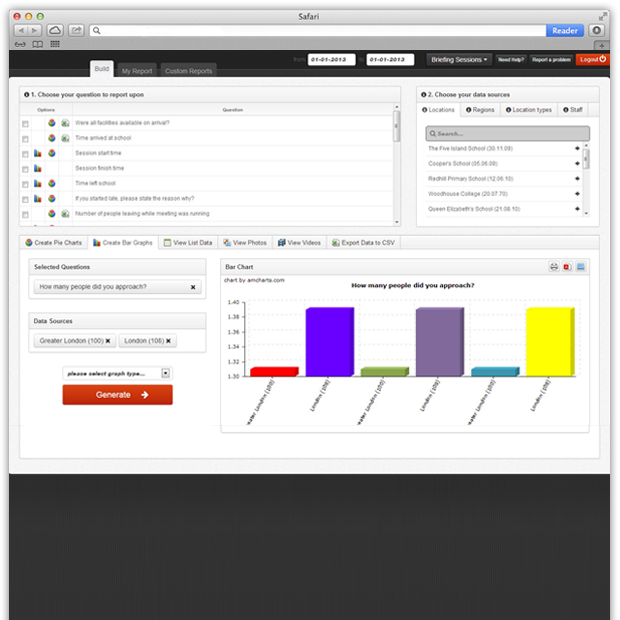 All of our reports are exportable to excel for ease of use and sharing. 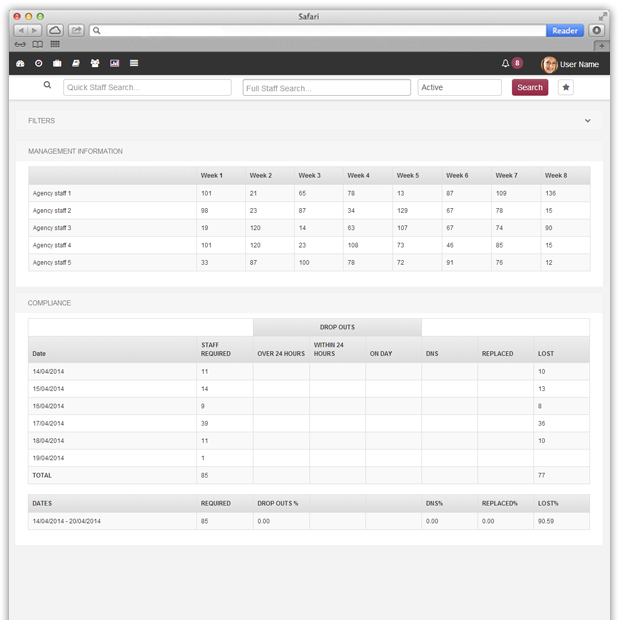 A client facing interactive campaign reporting system to show real time KPI's and allow the client to create custom charts based upon chosen specific data sets. View and download all quantitative (charts and graphs) and qualitative (FAQ's, comments, etc) data to docx or xlsx. 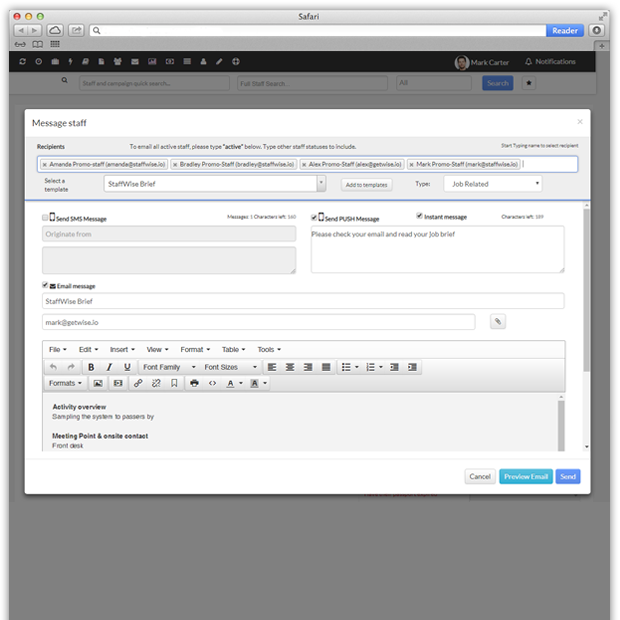 Browse though photos and chose to download individually or in batches. Or simply download all campaign data in one single nicely formatted xlsx file. 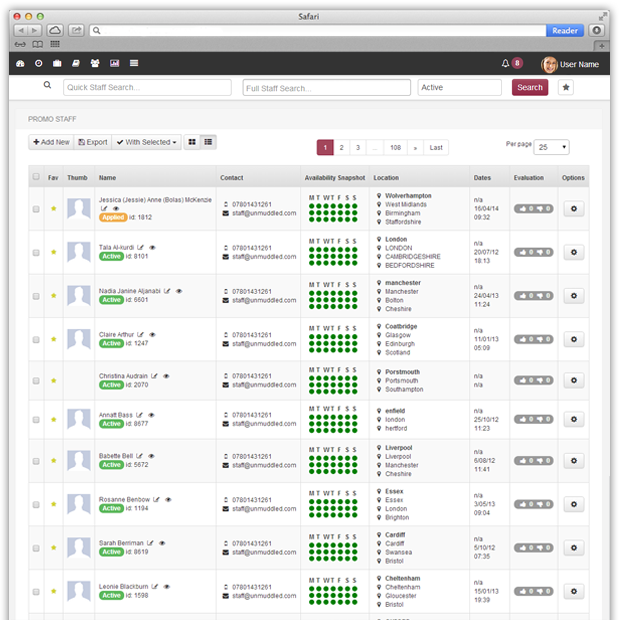 Keeping your clients constantly in touch with all the activity feedback as it happens.